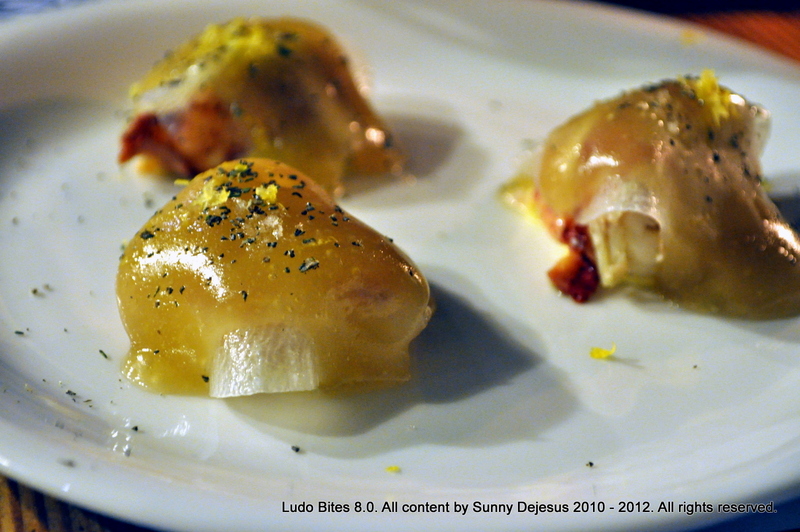 Ludo Bites 8.0 was yet another pop-up restaurant from Chef Ludo Lefebvre. You know, the French chef dude with his own reality cooking show Ludo Bites America. Well, his reality show is sort of on hiatus for now, which means more Ludo Bites pop-up dining in the Los Angeles area. For the nearly the past month, Chef Ludo has popped up at Lemonmoon where he’s giving diners a taste of his cuisine. 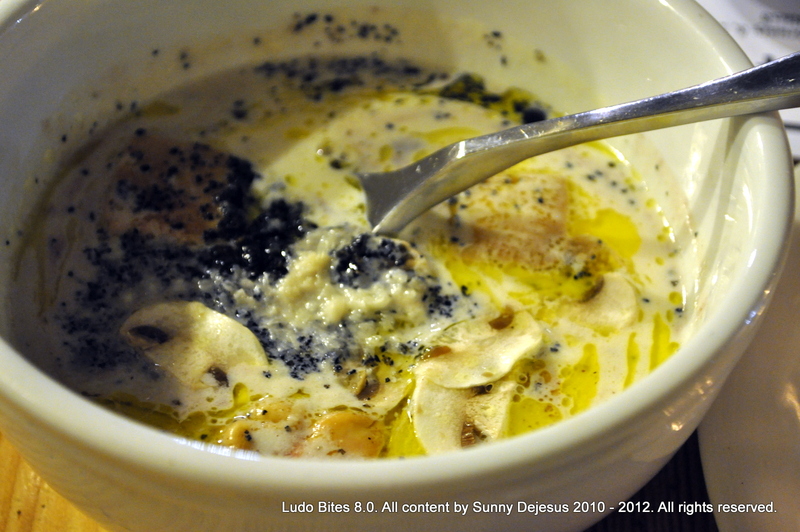 I was lucky to dine at Ludo Bites 8.0, because my friend Andree had the lucky streak in snagging a reservation. So, here are a few photos of the dishes that I tried at Ludo Bites 8.0. 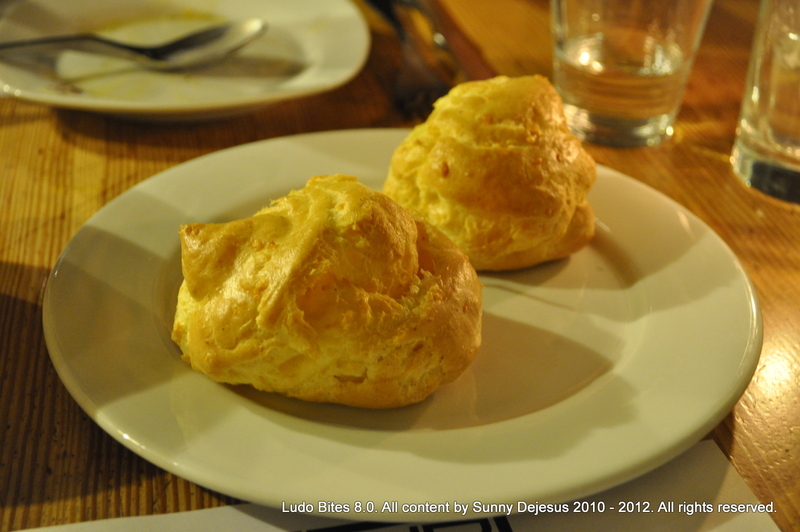 I absolutely love Gougeres also known as Cheese Puffs. I was quite happy to see that Chef Ludo Lefebvre had these tasty morsels on his menu. Nice and flaky with a lingering saltiness on your palate. Delish! Lobster Salad. It doesn’t look like a salad, does it? It was actually quite delicious. Who knew that lobster and honey were a brilliant pairing? This was an awesome Celery Root Soup. You’re probably wondering “What the heck is she talking about? Celery is such a BORING vegetable.” Well, don’t let this dish fool you, because there were plenty of seared foie gras bits bathing in the soup. The most expensive dish on the menu happened to be breakfast food. 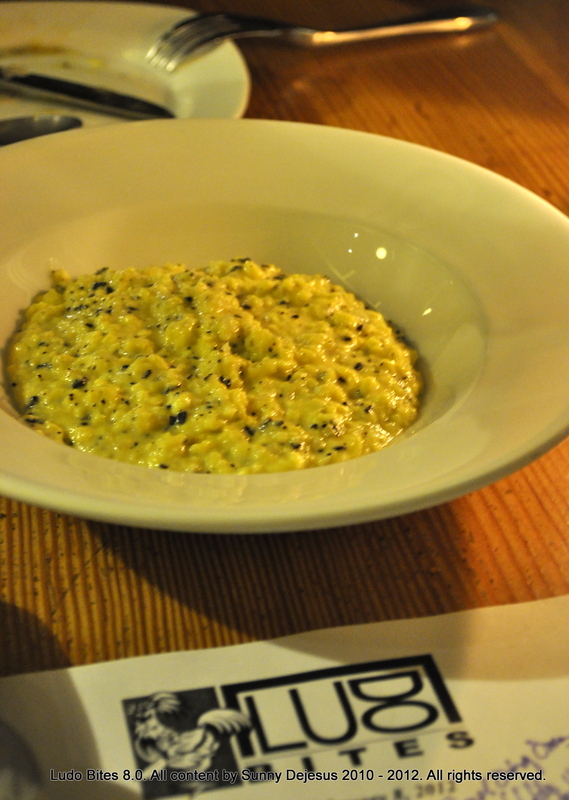 Yes, my dear Foodie friends, this was an expensive Scrambled Eggs dish with Black Truffle shavings. Sometimes it’s worth spoiling yourself every once in a while. 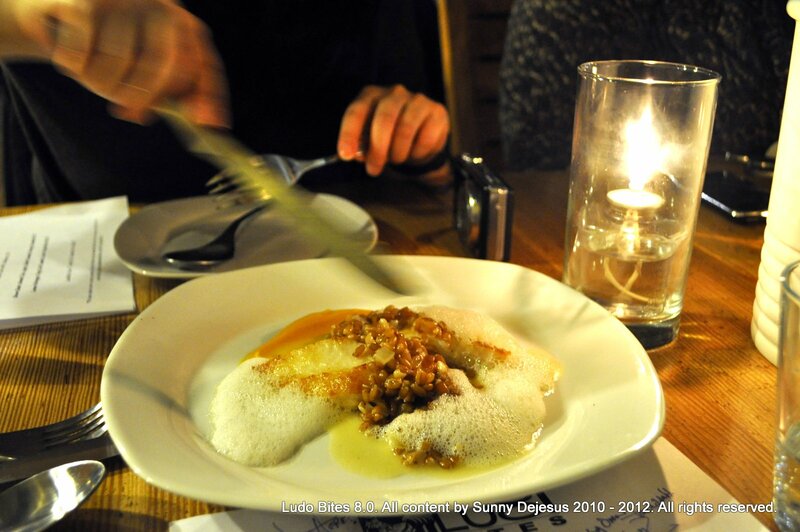 The John Dory was my all-time favorite dish of the evening. The fish was perfectly seared, the Fennel foam added a little brightness, and the Tonka beans gave it a slightly crunchy texture with each bite. A very well balanced and thoughtful seafood dish. I loved it! Chef Ludo never seems to disappoint me with the Hangar Steak. In the five Ludo Bites that I’ve attended, I’ve always discovered that Chef Ludo makes a pretty darn good Hangar Steak. For Ludo Bites 8.0, he upped his ante and gave his diners a taste of naturally raised, sustainable beef from Newport Pride Natural Beef. It was a surprise to cut into a piece of beef that was so naturally tender and buttery. It was also a surprise to find a handsomely marbled piece of beef with nice hues of violet and red. 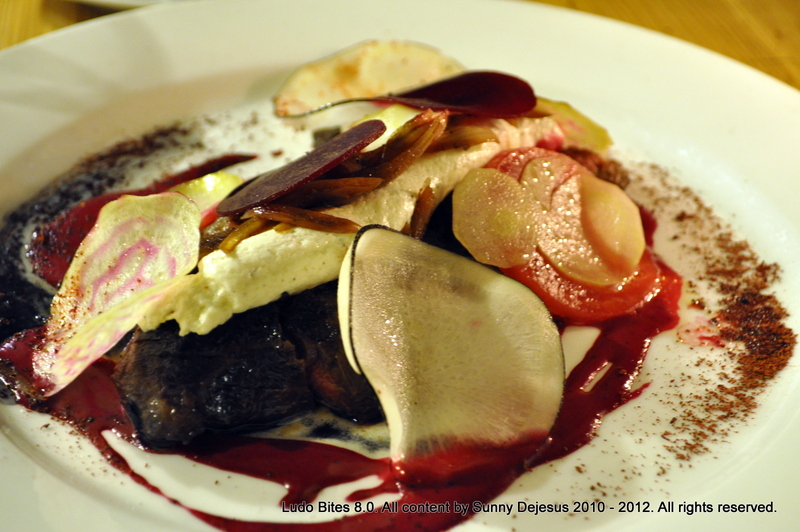 The goat cheese puree that accompanied this dish with the beets simply added to the uniqueness of this dish. Superb! Hey Chef Ludo? Thanks for spoiling us again with awesome French cuisine!